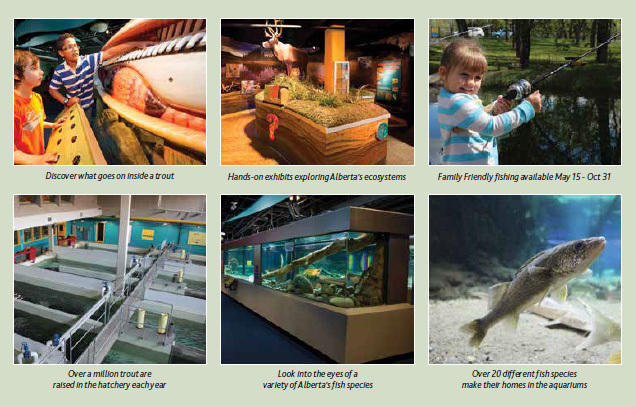 Showcasing Alberta’s fish, wildlife, water, and aquatic habitats, Bow Habitat Station offers a unique experience that connects visitors with nature in the heart of Alberta’s largest city. Located in a bend of the Bow River just minutes east of downtown Bow Habitat Station boasts 4 family attractions: a Discovery Centre, a Fish Hatchery, and an Interpretive Wetland. Bow Habitat Station aims to inspire visitors to evaluate and increase their environmental stewardship, and to champion the responsible use of Alberta’s natural resources and landscapes. 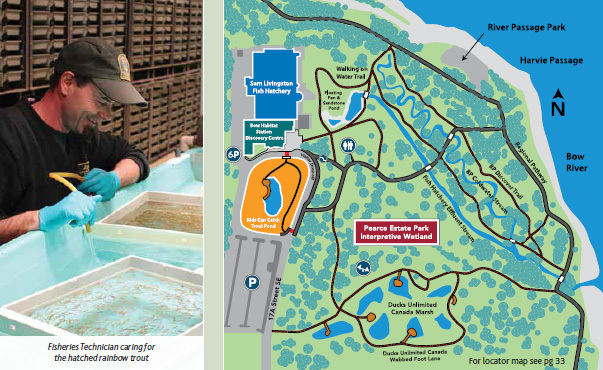 Although Bow Habitat Station officially opened in 2009, the Sam Livingston Fish Hatchery opened its doors way back in 1973 and many Calgarians fondly remember touring it in years gone by. It was this interest that sparked the Government of Alberta to expand the education and public outreach opportunities at the site by adding the Interpretive Wetlands in 2004, the Discovery Centre in 2009, and the Trout Pond in 2012. The Fish Hatchery’s location was selected for its proximity to a unique water source – and we’re not talking about the Bow River. The hatchery draws its water from an underground aquifer known as the Paskapoo formation. Its selection of water is ideal for the trout being raised inside as there is less risk of transferring fish diseases into the hatchery through the water. The water is close to the right temperature for raising the fish – between 6 and 12 degrees Celsius. If you’ve never visited a fish hatchery before, or even if you have, the Sam Livingston Fish Hatchery offers a unique opportunity to visit one of North America’s largest enclosed hatcheries. On a guided tour, you will discover how over a million trout are raised each year, while learning about the journey they will take to over 200 different lakes and ponds across the province. Visitors get a special treat at the end of the tour when they get to feed 1,000s of eager trout! Regularly scheduled public tours of the Fish Hatchery take place Tuesday through Saturday, at 12pm and 2pm on a first-come, first-served basis. outside. You’ll learn about Alberta and its fish, wildlife, water, and aquatic habitats as you explore five galleries of interactive exhibits. Plus, you’ll be able to dive deep into Alberta’s waters and look into the eyes of over 20 different fish species in 13 aquariums. The Discovery Centre is open year-round, Tuesday through Saturday from 10 a.m. until 4 p.m. In addition to the interactive displays and aquariums, a variety of programs and clinics are available for families, groups, and schools. Visit our website for admission prices at bowhabitat.alberta.ca. Fish from the hatchery are also stocked into the Kids Can Catch Trout Pond each spring. This catch-and-release pond allows you to enjoy the lure of fishing without leaving the city. Don’t have your own gear? Not to worry – fishing rod rentals are available for only $5.00 per day. As you relax, and enjoy this natural oasis you’ll find it hard to believe you are only minutes from downtown Calgary. Looking to enjoy some time outdoors? Take a stroll along one of the trails of the Interpretive Wetland’s 21 acres of natural beauty. From floating fens to marshes with boardwalks, the winding trails will lead you through a variety of the aquatic environments found throughout Alberta. Keep an eye out for some of the wildlife making their home in the wetlands, including porcupines, birds, and, of course, fish! The Interpretive Wetland and Trout Pond are both outdoors and free of charge. The Interpretive Wetland is open daily, yearround from 5am to 11pm. The Trout Pond fishing season runs from May 15 to October 31 annually. As a designated park ‘n’ bike lot for the City of Calgary, there are ample routes to the regional pathway running west along the Bow River past downtown, eventually connecting to the scenic trails adjacent to Memorial Drive, or south past the Inglewood Bird Sanctuary, eventually leading to Fish Creek Provincial Park. With its variety of programs and activities for the whole family, Bow Habitat Station is fast becoming one of Calgary’s favourite hidden gems. One visit and you’ll be hooked!